Justin Huntly McCarthy’s 1901 novel romanticizing the life of French poet and petty criminal François Villon (1432-1463) was so popular, it spawned a play, an operetta, a 1920 silent film, and was the uncredited source material for John Barrymore’s The Beloved Rogue (1927). 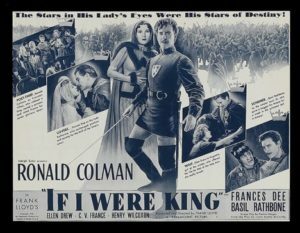 Paramount decided to revive it as a starring vehicle for Ronald Colman following his success with The Prisoner of Zenda. It was intended to be a top-of-the-line prestige picture, no expense spared, and they hired enfant terrible Preston Sturges to write the screenplay. This was an inspired choice, and his script for the film was one of Sturges’s favorites. Much of Villon’s poetry in the film was translated from French by Sturges himself. It’s midwinter in the mid-fifteenth century, in Paris under siege by the Burgundians. Villon (Colman) is being pursued by the city watch for thieving, and goes to ground in the rectory of the priest who raised him. The priest drags the abashed but unrepentant poet into the church to pray for his sins, but his attention is diverted by a beautiful penitent, Katherine de Vaucelles (Francis Dee). He falls in love at first sight, and writes a poem for her on the spot, an act that persuades her to be his alibi when the city watch catches up to him. We follow Katherine back to the palace where, after a little more exposition, we’re introduced to King Louis XI, and OHMYGOD it’s Basil Rathbone, barely recognizable as he completely inhabits the role of that fearful, cunning, cackling, conniving, but ever-brilliant monarch. No wonder Rathbone was nominated for an Oscar for Best Supporting Actor for it. There’s no tale about Louis XI that isn’t about plots, treachery, and betrayal, and that’s where this one goes immediately. King Louis, investigating a conspiracy while incognito, gets embroiled in a situation that Villon accidentally gets him out of—by killing the Constable (i.e., head general) of France. So Louis, for wily and devious Reasons of State, appoints Villon the new Constable. Hilarity ensues. And it’s time to talk about Ronald Colman’s performance, as Villon and as the impostor Constable of France. At the beginning of the film, Colman’s Villon is high-strung, voluble, and twitchy, as if suffering from delirium tremens, but as soon as he falls in love with Katherine he begins to be more upright and serene, and once Louis appoints him Constable he becomes suave and urbane—Rudolf Rassendyll, basically. It’s not really a very convincing transformation, but Colman is so charming and clearly having such fun it’s better to just go along and enjoy it. Sturges updated McCarthy’s old stage play by leaving its hoary clichés intact but giving it witty, self-aware dialogue that enables Colman to mock the source material and bring the audience in on the joke. He doesn’t quite break the fourth wall and actually wink at the viewer, but it’s awfully close. Watch for one of the best castle dungeons in a genre full of them, Francis Dee’s amazing two-and-a-half-foot tall pointed wimple, and her cool sedan chair suspended between two horses, something I’d never seen before. But really, Rathbone’s performance is reason enough to watch this film, and if you’re a fan, it’s worth seeking it out just for that.